Inflammation - Is it the Root of All Evil? These days you are being bombarded with anti- inflammatory foods/drinks/ supplements so I figured it might be worth putting my two cents in. Basically, it is a process by which the body protects us from harmful organisms such as bacteria and viruses. It also repairs wounds, tears, sprains and muscle damage from training. This is would be acute inflammation since it responds to specific cause. This type of inflammation in itself is not harmful at all (every workout causes inflammation to some extend) but it can become chronic. 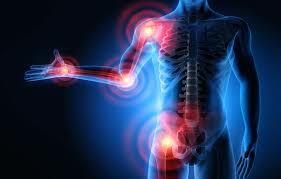 Chronic inflammation can contribute to arthritis, depression, heart disease or even cancer. We do not quite know how chronic inflammation happens, so we far we assume that the body mistakenly sends out white blood cell toward a signal that would not require them. What is to be done? Certain changes in your diet can bring down inflammation. Disclaimer: none of the following food choices will cure cancer, but they will give you a better quality of life. Anything that is overly sweet, processed or deep fried is not a good idea to consume when dealing with inflammation. Also processed meats, alcohol and refined sugars/ flour should be limited. Please note I said limited, not avoided. Anti inflammatory foods would be cold water fish, avocado, leafy green veggies, broccoli, walnuts, blueberries, chia seeds and coconut. As for the supplements like turmeric, most research has been done on mice but it won’t hurt you. As always, use common sense. A hot dog on the weekend will not make you a diabetic, just like a handful of blueberries won’t make you superman/woman. Previous post: NYC PERSONAL TRAINER MAIK WIEDENBACH EXPLAINS WHY YOU DO NOT NEED TO LIFT HEAVY! Next post: I Found the Magic Pill!